Quinnipiac's volleyball team struck first, but Navy proved to be stronger offensively in the fifth set Saturday morning. Through four sets, the Quinnipiac Bobcats had matched up with the Navy Midshipmen fairly evenly. But in the fifth set, the Bobcats saw a high-powered Navy offense that has recorded more kills than its opponents in its last two – now three – matches. Navy outkilled Quinnipiac 13-4 in the decisive fifth set and defeated the Bobcats 16-14 in the set and the match. The Bobcat defense allowed 56 kills, the most it has allowed all season, but in terms of kill percentage, Quinnipiac has faced better. Navy’s .211 kill percentage was nearly 100 points better than Quinnipiac’s. Compare that to the .474 percentage Cal St. Fullerton had against the Bobcats, and it’s miniscule. “We had played six really tough teams,” Quinnipiac head coach Robin Lamott Sparks said after winning Friday night’s game against La Salle. Among those teams included nationally ranked UCLA, who defeated the Bobcats in straight sets when they met at the very beginning of the season. Cal St. Fullerton had the 35th-best RPI in the country last year, while the other four schools the Bobcats played on their six-game opening road trip all ended their seasons with RPIs in the top-135. The Northeast Conference only had one team (Sacred Heart) with an RPI in the top-200 last year. Quinnipiac is no stranger to seeing high-powered offenses and seeing players like Carolyn Ewert earn 20 kills in a game – including six in the fifth set alone for the Midshipmen. With a new roster that brings forth a lot of depth, Sparks said there is time for her to figure out the lineups and for her players to get in a groove. 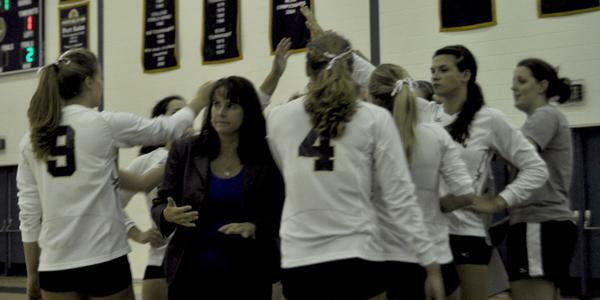 Quinnipiac’s offense emulated what other teams did to it in the fourth set, when three Bobcats had four or more kills. Taylor Payne, Brittanie Robinson and Tierra Allen combined for 15 of the 18 kills Quinnipiac had in the set the Bobcats won 25-17. The Bobcats have seen dynamic offenses through their first eight games. Now they need to make one of their own.